Whether or not Charles Rennie Mackintosh sensed that a modest terraced house in Northampton would contain his last major work may be beyond conjecture, but by 1916 he must have known that what reputation he had in Britain was on the wane. His masterpiece, the Glasgow School of Art, had been completed in 1909 and no spree of new commissions had followed. In 1914 Mackintosh and his wife Margaret left their native Glasgow to settle in Suffolk. This proved to be a brief stay: Mackintosh’s strong accent, cape and deerstalker garb, and suspicious habits of walking and sketching got him mistaken for a German spy. By 1915 the couple had moved to London. If Mackintosh’s most successful years were behind him, WJ (Wenman Joseph) Bassett-Lowke was a man on the up. He had achieved his means and money not via the traditional Northampton route of footwear and leather manufacture, but through the production of precision boat and railway models. In 1916 he was to be married and needed a house to bring his bride home to. Bassett-Lowke was an enthusiast for modern design and innovative technology, and might, in peacetime, have had a house built from scratch (as indeed he was to do nine years later). But in the midst of the Great War, with its shortages of materials and labour, this was impractical. Instead Bassett-Lowke bought a house on Derngate, not far from the city centre, and set about improving it. Having employed a local architect to make some initial structural alterations, including a front bay, Bassett-Lowke looked about for someone to design the interiors. What he had in mind was more of a collaboration than a commission and he was to be a demanding and hands-on client. Mackintosh was recommended to him, though the choice may not have been a straightforward one. While Bassett-Lowke was a convinced modernist, Mackintosh, whose career had begun in the 1890s, was, and remains, unclassifiable. No doubt, there were many discussion and disagreements when it came to fitting out 78 Derngate, but as far as is known, the eventual outcome was satisfactory to both men. 78 Derngate is a small house and a narrow one. Mackintosh expanded the space by moving the staircase to the middle of the house. He also added a shallow back bay, creating a balconies for the bedrooms and extending the kitchen. This geometric monochrome bay is a striking example of modernism before Modernism, a sight of the future revealed in wartime Northampton. The interiors embody a genuine and largely successful collaboration between the two men, a meeting of creative but practical minds. The bathroom and the kitchen, spheres of technology and utility, show Bassett-Lowke’s influence. The mod cons include electrical appliances and pull-out shelves in the kitchen, a silvered pane of glass in the bathroom window to make a shaving mirror, and a state-of-the-art bath and shower combination imported from America. 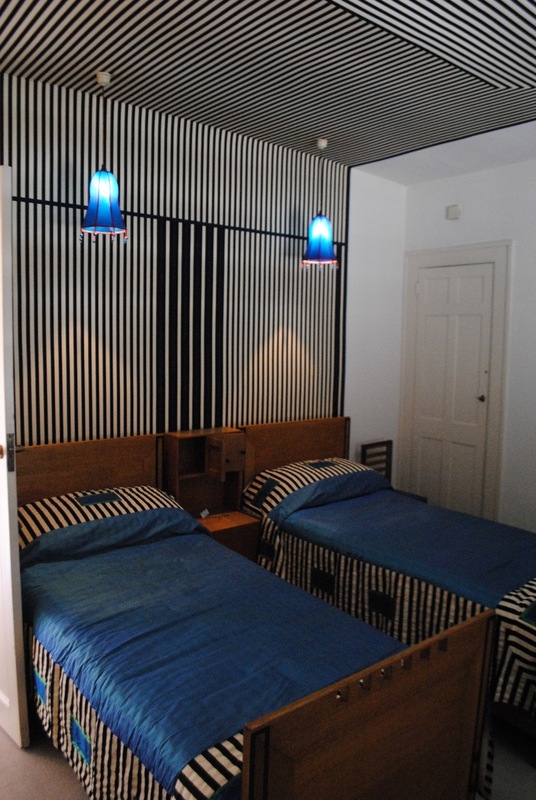 It is in the four rooms of intimacy and sociability – the two bedrooms, the dining room and the hall-lounge – where Mackintosh’s ideas are most apparent. A house, observed Gaston Bachelard, is ‘the topography of our intimate being’, and a home contains different intimacies: the intimacy of the dining room qualitatively differs from that of the bedroom. 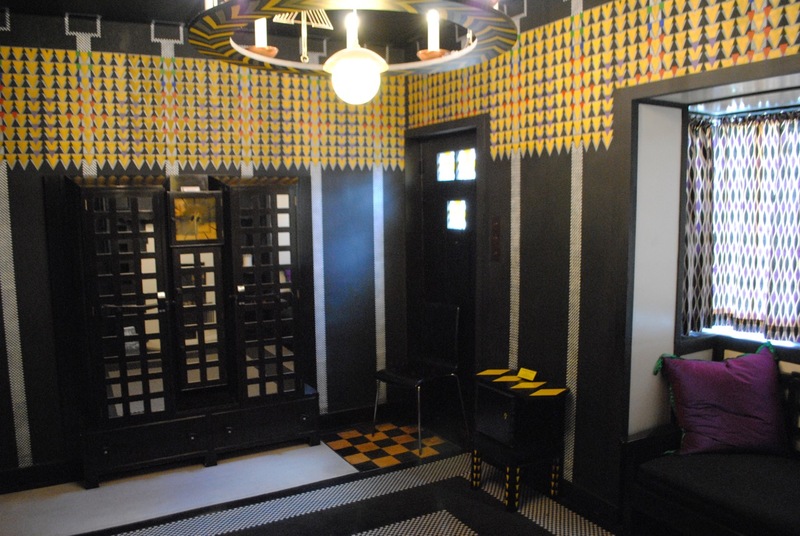 Each of these rooms in 78 Derngate has its own character, motifs, and colours. The dark neo-chinoiserie of the lounge, with its rectilinear ‘trees’ in black with yellow triangles, and the guest bedroom, with its wall-and-ceiling ‘canopy’ of black and white stripes are, once seen, unforgettable. 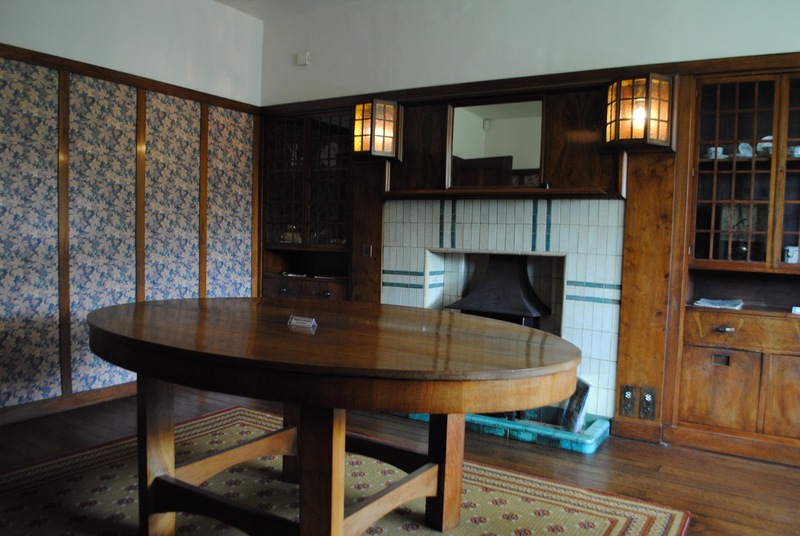 The master bedroom and dining room are less exuberant, more constrained, but still imprinted with Mackintosh’s distinctive imagination. What the visitor sees today when they visit 78 Derngate is part uncovering and part reconstruction. When the Bassett-Lowkes moved in 1926 to their modernist house New Ways, 78 Derngate passed through several owners before being acquired by Northampton High School for Girls in 1964. By this time surfaces had been covered or painted over, furniture and fittings had been dispersed (some went to New Ways). 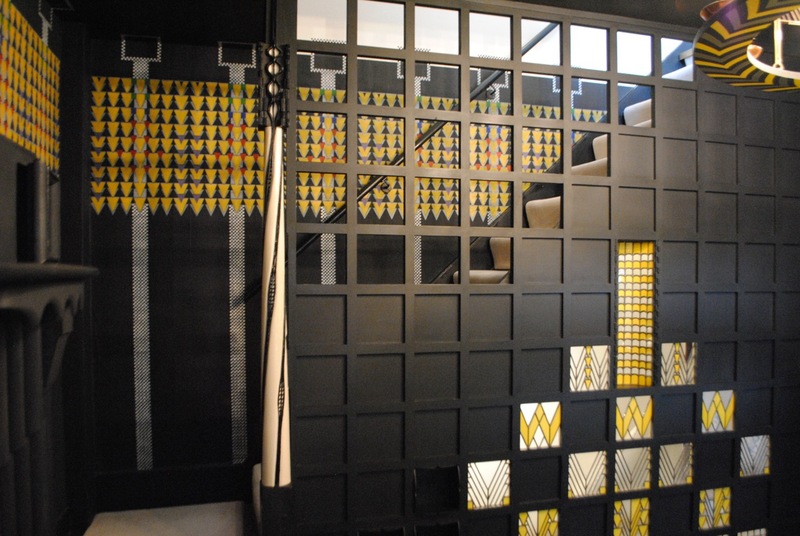 The rebirth of the house began in 1998 when the 78 Derngate Northampton Trust was formed and took on the project of restoration. 80 Derngate was acquired and turned into a visitor centre (later on, No. 82 was added), and 78 Derngate reopened in 2003. The Trust’s website has much more information about the house and the restoration. Do visit if you can – 78 Derngate is a gem, the guides are friendly and knowledgable, and the experience will stay long in the memory. It is a house to dream in.